Most IELTS candidates leave their test preparation to the last minute. When they go into the test centre, they discover they don’t understand the question types, they’re not sure how to allocate their time efficiently, and they don’t know what the examiner is looking for. And this is just the basic knowledge they lack. ClarityEnglish and the British Council are trying to solve this problem, and to go much further. We have developed three free resources that tackle the nuts and bolts of IELTS prep, but also provide the scope for committed candidates to go further, and find out more. Clarity’s IELTS blog includes dozens of posts from IELTS experts explaining task types, preparation ideas and pitfalls to avoid. 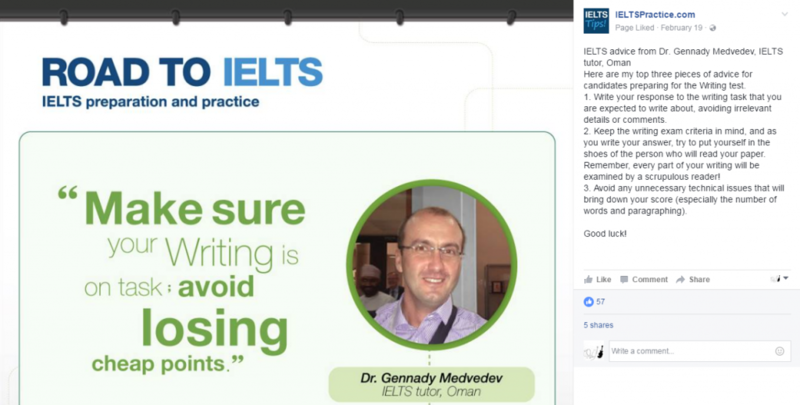 Peter Hare (British Council Addis Ababa) reveals that 23% of answers submitted in IELTS Writing are under the required word count and develops a strategy for avoiding this problem. Colm Downes (British Council Indonesia) points to a TED Talk showing that just two minutes of ‘power posing’ before the IELTS Speaking test really can change the outcome. Andrew Stokes from ClarityEnglish points to a 1970s study suggesting that a test taker’s cultural background can influence their performance in the Reading paper. What measures can Chinese or Arab candidates take to avoid being disadvantaged? Point your students to the IELTS blog here. 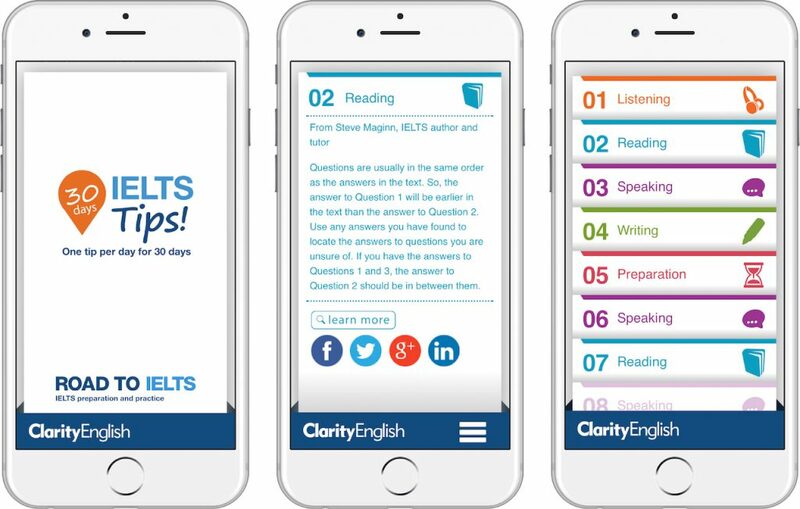 The IELTS Tips phone app drip feeds key IELTS information one day at a time for 30 days. There are five categories of tips: Reading, Writing, Listening, Speaking and Preparation. Test takers can spend as little as a minute reading key facts or can follow links to get their hands on more comprehensive resources on the Internet. It’s all about repeatedly stimulating their interest! The IELTS Facebook page has attracted over half a million fans. It features downloadable worksheets, sample questions from the different papers, videos of candidates explaining how they prepared for IELTS, and a lot more. Click here to visit the IELTS Facebook page. These resources are cross-platform, and students can access them on their desktops, or on the go on their phones or tablets. They are all available free of charge. If you think they would be useful for your students, simply post them the links below. Dear Yasmin, thanks for your interest in Road to IELTS. I notice that you have already got access to the free Last Minute version of Road to IELTS. If you wish to get a complete set of practice contents, the Full Version is available to subscribe online at http://www.ieltspractice.com/buy.php. Should you have any further questions about Road to IELTS, please feel free to contact our Support Team at support@ieltspractice.com. How to get access for road to IELTS.i logged in but i cant able to do the practice.kindly guide me. Thank you for your message, Pradeepha. We have asked a Support Officer to get in touch with you — please check your inbox. I have taken ielts academic several times, but always I am getting one of the component very low. either reading, writing ,listening or speaking.please advise me what I have to do.